This Pill millipede was found when I went to Charmadi Ghats recently. it was crossing the State Highway 64. I picked it up and curled into a nice ball. I left it on the other side and proceeded towards Mudigere in Chikmagalur District. It belongs to genus Arthrosphaera under Sphaerotheriidae family od order Sphaerotheriida. Pill millipedes make up two orders of millipedes, often grouped together into a single superorder, Oniscomorpha. 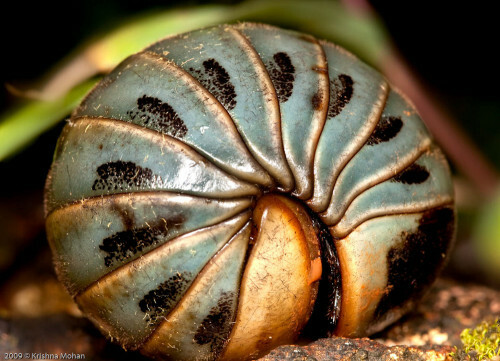 Pill millipedes are short compared to other millipedes, with only eleven to thirteen body segments, and are capable of rolling into a ball when disturbed. Evolutionary importance of Pill millipedes is that even though the northern and southern hemispherical pill millipedes evolved separately, both developed capability of rolling into a ball when disturbed. This is an example of parallel evolution, rather than homology. The Order Glomerida is found in the Northern Hemisphere and includes species such as Glomeris marginata, the common European pill millipede. They have from twelve body segments, and lack the defensive repugnatorial glands found on many other millipedes. The Order Sphaerotheriida is a Gondwana-distribution taxon, with around 100 species in southern Africa, Madagascar, Australasia and south-east Asia. They have thirteen body segments, and possess repugnatorial glands releasing nasty chemicals like rest of the millipede family. Nice shot, have not seen them here. May be they are there but less in number?! they don’t exist near our homes but found throughout western ghats. Rainfall, moisture and leaf litter is needed for them. Excellent information and the parallel evolution part was surprising :). Thanks for sharing.